Gold medallist at the London 2012 Paralympic Games and the defending champion in Beijing, Germany’s Holger NIKELIS made a fine start to proceedings at the ITTF-World Para Table Tennis Championships. In Class 1 in Men’s Event NIKELIS recoreded two straight games victories in two opening rounds. NIKELIS accounted for Kuwait’s Hamed LATIF and Korea’s NAM Kiwon. Denmark’s Peter ROSENMEIER, who like Holger NIKELIS is seeking to repeat the success of four years ago. In Class 6 in Group stage he beat Thomas RAU of Germany and Valentin KNEUSS of Switzerland. Another European star in China, Austria’s Stanislaw FRACZYK, silver medallist in the London 2012 Paralympic Games, had a fine start. In Class 9 he overcame ZHAO Yi Qing of China and Tonnie HEIJNEN of Netherlands. At the recent Stag World Veteran Championships in Auckland, FRACZYK won the Men’s Singles 60-64 years category. 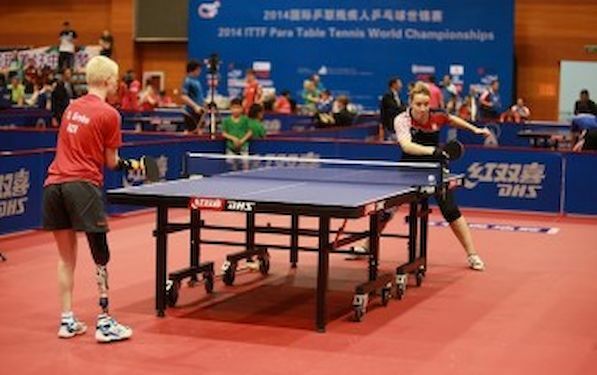 Gold medallist at the London 2012 Paralympic Games and the winner at the 2010 World Para Table Tennis Championships, Poland’s Natalia PARTYKA. In Class 10 she beat both her adversaries in Group 1: Hilal TURKKAN of Turkey and Daria SARATOVA of Russia. Kelly Van ZON of the Netherlands in Women’s Singles Class 7 was stretched to full distance in both her first stage matches. China’s WANG Rui and Faiza MAHMUD of Egypt put her on severe test, before Dutch player prevailed. in Class 6 Sandra PAOVIC of Croatia lost only one game in two matches against Antonina KHODZYNSKAYA of Poland and Stephanie GREBE of Germany.